A long overdue reunion of friends was happily met with sunny skies one Wednesday afternoon in London. Damon & Michelle, two Texans I had the pleasure to make the acquaintance with back in Austin, had arrived in London in upbeat tempo. Regardless of over 30 hours lack of sleep (attributed to the excitement and unfortunate airplane turbulence that so often interrupts a good transitory snooze) they remained exuberant when I found them waiting patiently at London Bridge before we headed off for our evening of jazz and musical compositions, courtesy of Guido Spannocchi (on saxophone) with the accompanying bass & drum playing skills of Jason Simpson and Brian Hedemann. Before I rave about the music for the evening (it was indeed aural pleasure), let me first provide suitable information about the wonderful venue itself. 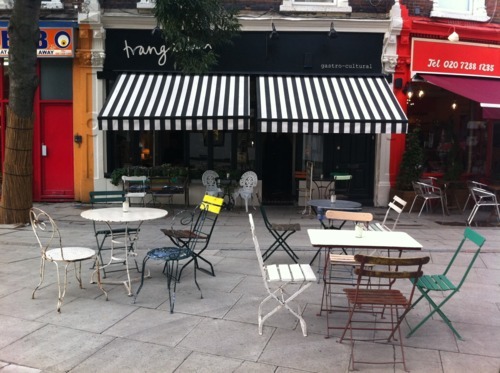 Trangallan (located near Newington Green) lends itself as tapas bar but it is far more than this. 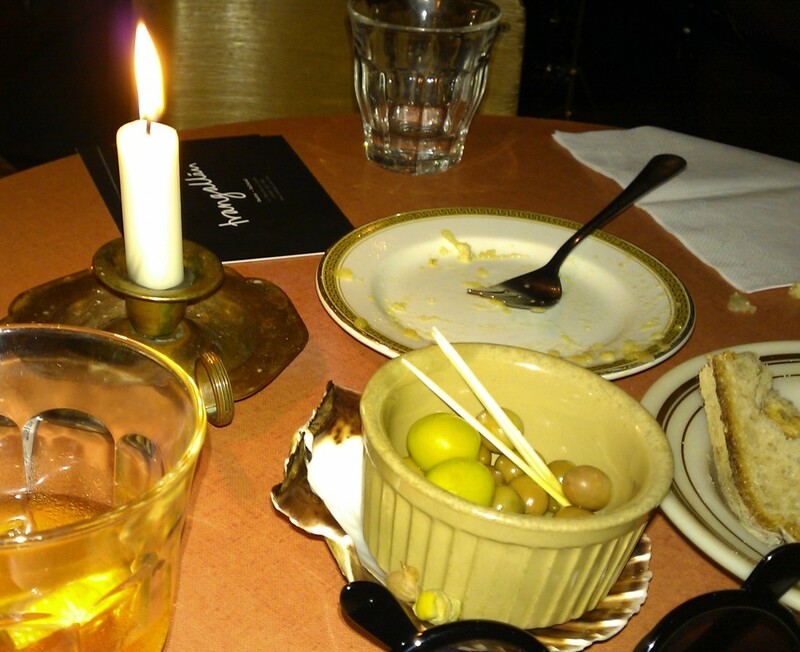 Externally it is akin to European cafes; a simple unassuming, black canopy first attracts you, then the chic locals sipping wine & smoking cigarettes in the outdoor seating area. Inside there are more surprises as it is also a creative venue for Music, Art and Film! All senses seem to be catered for at Trangallan, their menu is minimal yet delicious (a range from Tortilla de Patatas to Salt Cod) and all, understandably, tapas style. The menu is refreshed regularly in-keeping with seasonal produce so another reason to come back and taste further dishes (I only managed to sample the excellent tortilla which melted in the mouth, along with a very refreshing courgette salad). Their wine list is far more extensive, with an impressive choice of Sherries as well as natural wines and good quality reds and whites. As mentioned, Trangallan not only offers its guests food, but also host screenings (cult Spanish films), Live Music ranging from Gypsy Folk to Jazz , Live Art performances and now also a Cabaret night! This is utopia for the Creative mind, and it is an honour to visit such places when not only do they support the artists that play by providing the venue itself, all of the staff share the passion that flows through the whole place, from the kitchen through to the bar; their smiles and genuine delight at the entertainment that opens up before them is infectious and only excites the customer more. So onto the music! As mentioned in a previous article, it would seem that the enigmatic Guido is indeed conquering London and with many a performance more to come, he brought himself to Trangallan thankfully with a live set that completely mesmerised my friends and I, with melodies and beats that still permeate my mind. Guido wrote most of the set and his compositions are wonders for the ear which you have to hear live to fully appreciate (http://audioguido.com/). With both Jason and Brian to complete the trio of instruments, the audience were driven euphoric through the incredible and raw talent that brought these three fellows together for the first time. That is the perpetual wonder of jazz and such genres; the outcome, when there is an affinity with both instrument and musician is truly astounding. Brian’s drumming had to be seen to be believed, with Jason’s enchanting upright bass that kept up with each pluck through to Guido’s amorous dance with his saxophone; all came together and created magic. So if you spy their names in the local listings, you must go watch. I always prefer music live so it can truly envelop your whole being, which is the greatest compliment to any musician seeing the sheer joy their work brings to the listener. 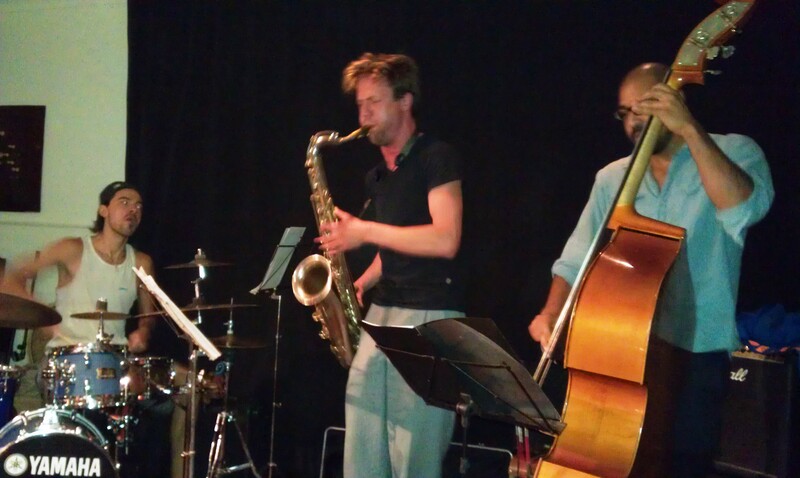 My friend Damon (also a saxophonist) was so excited that he may well be jamming at another gig with them before their flight whisks Michelle and himself away from London, so what an eventful night! Good food, good music and good friends. What more can you ask for? Ah yes, it would seem so many other things, at least at Trangallan.